Totally scored 2 skeins of yarn for 50 cents each and a 100% virgin wool skirt for $3 that I plan on repurposing into something useful, maybe a kids jacket or mittens? I also got a really cute vintage wall plaque of a little german boy and girl for a quarter today! It was a good day thrifting! Now I can't wait to make myself a new hat out of one of the skeins I found today! Totally scored a 1923 red handled egg beater with ekco glass measure for 2.00. Im thrilled. A $120 Irish hand knit sweater for $6 (Looked it up on line). I don't think it was ever used. Oh and I always get compliments on the felted purse I got for $2. I love thrift shops! Plus I got some more yarn for 50 cents each :) I just love thrifting, its so much fun! I'm hoping to get some old sweaters to get some yarn to repurpose and some old sheets to make into baby wipes. Happy Thrifting!!! A vintage chalk ware chicken bank. She's about the same size as a real hen and she has 2 chicks. It's so cute. I also got a vintage wall pink and black rooster wall pocket. I got the chicken bank for $20 - that my boss gave me on my day off for helping out when I stopped by. I know this isn't vintage but we just got a new HE washer for almost 75% off from a box store. I am so excited and telling everyone. A $5.00 Sanyo TV to replace one that is having vertical hold problems. My hubby is going to try to repair this but, for now, a decent replacement. Perhaps, down the road, we'll try to go for a flat screen. 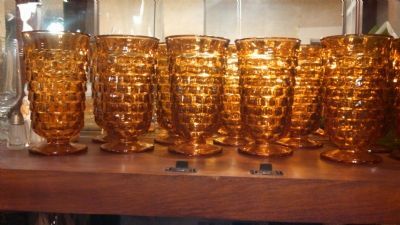 Anita...Wow what great finds! Scored so well. 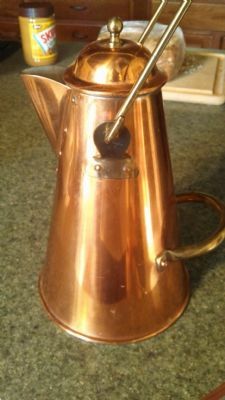 Scored this beautiful copper and brass coffee pot. 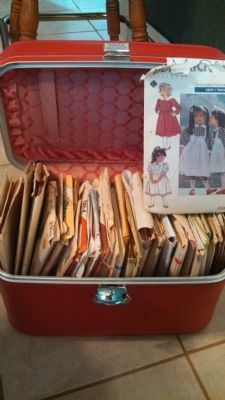 Came across a bunch of vintage sewing patterns that came home with me in a vintage Emelia Earhart train case ! The little girl's pinafores are so adorable. I don't know how to resize my pictures, hope I'm doing this right. Anita you hit the jackpot. Where did you go in Madison .I probably would know about it? A nifty, very compact little purple travel iron made by Sanyo. The handle comes off and goes flat around the iron part, very compact! Great little goodie to add to my glamping gear . . just in case! Yes, I tested it to make sure it works before buying it! 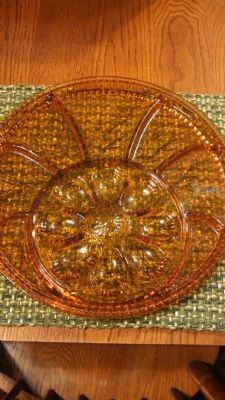 I found some great items yesterday at the Craft Warehouse and Goodwill- The red peppers, a whopping 28 cents, a Pier One item, ha! At G.W. I love the color of the peppers! $1.00 (90% off) for the Noel star and $4.00 for the gnome at the C.W., greenery at G.W., $3.00, Old Navy scarf, $1.00 G.W., 3 brand new Ikea jars, 99 cents each. GW. I may use them for ointments or salves, white pips, 99 cents, also G.W. Wow Nancy, LOVE all the awesome stuff you found. Isn't it fun to come home with fab bargains ? I found a small cast iron frying pan (was VERY excited about that, they're hard to find) for $3.99 and a Youth Bible I was looking at in the regular store got that for $4.99. Found a candle stick lamp for 1.50. It had the orginial tag on it, marked $17. There is a huge rummage sale at the armory. I'm so going but with a list. I need to not impulse buy. 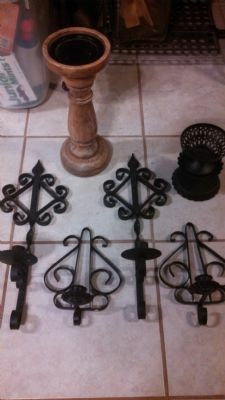 I'm looking for gardening items, pillow cases, rubber stamps and buttons for crafting. Food for thought, no farm no food. Some of us glamping farmgirls went thrifting during our recent Backyard Glamper Party & Sleepover. This is my daughter, Robin . . . aka "Birdie" . . with her #3.00 Samsonite suitcase find (it needs the lining replaced which I'm going to do for her) and her cute skirt. She just put it on over her jeans to see if it fit and just wore to the counter to pay for it. She jokingly asked if she could get a discount for modeling it . . .the folks in the thrift were great folks and just plain friendly . . .but I don't recall if she got a discount or not. Then she wore it to some other stops we made. A fun day! I have a similar suitcase only it's bright orange and the lining needs to be reglued. It is certainly easy to spot at the baggage claims. I'm taking a thrift store break right now..Trying to focus on finishing projects I already have and placing them where they need to go. But I will keep living vicariously through your finds!!! I haven't been on this thread for a while so I'm just getting caught up on all of the wonderful treasures you guys are finding. Darn it, CJ!! I'm getting sick of all the cute baskets and suitcases you are finding, you lucky lady! You need to put a sign outside of your thrift store telling people their new donation drop off is at the St. Vinnies in Fort Atkinson, WI so I can score some of the awesome stuff you find! :) Love it! Anita, I just love the suitcase filled with patterns! It's like a farmgirl treasure chest! Anyone know this gal? DH found her blog this morning. We're planning a FAMILY adventure tomorrow morning, and will head this route. Hope to find a couple of fun birthday presents... and a fun time with DH and my boys (ages 6 & 9). Well, I found this at our Methodist Thrift yesterday for $1.00! A Samsonite case that is squarish . . 21 x 21 with extra goodies inside. It really only needs cleaning,(which I haven't done yet) no major refurbishing. This will be GREAT for my clothes for our upcoming Glamping Road Trip! And, the cream color matches some of the other pieces I've been able to find! YAY!